With our focus on last-mile healthcare access for remote rural populations, it may sound like a contradiction to address the pressing challenge of improving access for urban populations. But in 2010 that’s exactly what we’ll be doing. In August and September we were in India to look at locations for a new vaccines distribution program, and to facilitate a workshop of local and regional NGOs, UNICEF, the Ministry of Health and Family Welfare (MOHFW), and the corporate sponsor of the program. 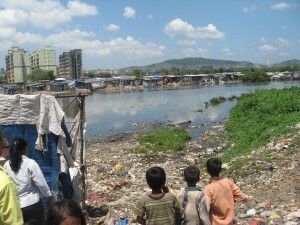 One of our site visits included a trip to one of Mumbai’s largest slums, built right on top of the city’s main garbage dump. The workshop highlighted inadequacies of the cold chain in addressing the government’s immunization goals, critical gaps in energy, communications, and transportation infrastructure that exist for many last mile communities; and that health workers are overburdened due to the scope and scale of their day-to-day work. Not surprisingly, our experiences in sub-Saharan Africa are addressing these same issues. How did we get from rural to urban? As part of the workshop we included discussions on India’s population growth and industrial development that is leaving millions behind in rural communities throughout the country. The three states of Bihar, Madhya Pradesh and Uttar Pradesh make up over 50% of the country’s estimated 10 million unimmunized children. That’s the largest unprotected population of any one country on the globe. The great majority of theses states’ children are the very rural poor. But two of these states also have the highest child mortality rates for urban poor communities in the country, which highlights the correlation between the rural poor and the rapid urbanization of the country, as desperate migrating families look for employment. Dr. Siddharth Agarwal of the Urban Health Resource Centre, based in Dehli, is a passionate and persuasive advocate for these urban slum communities. 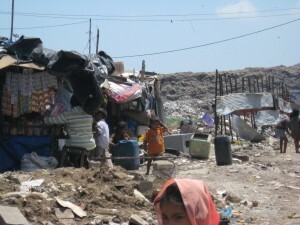 Not unlike remote rural communities, urban slum populations are difficult to reach. There is weak physical infrastructure, limited reliable health services and poor documentation of the populations. The plight of India’s city slum dwellers certainly isn’t a new topic … Mumbai’s Dharavi Slum of “Slumdog Millionaire” fame helped ensure that, but that the task of improving last mile healthcare access for the urban underserved is strikingly similar to that of rural communities, certainly may be. This week VillageReach President, Allen Wilcox, will be speaking at the 2nd Annual Global Health Supply Chain Summit. The theme of this years conference is “Bringing Government, NGOs, and Academia Together: What can be learned from the for-profit world?” We are excited to be included in this conference again this year- the theme alone could be a subtitle for VillageReach’s mission. Allen will be speaking about what logistics and supply chain bring specifically to the last-mile. VillageReach’s experience shows that since the last-mile is often much weaker than the rest of the health system, programs can have a disproportionately large impact by effecting change at this level. Our colleagues at the Zaragoza Logistics Center have been doing terrific work bringing their academic backgrounds to bear on problems in global health supply chains. As the “implementers” in the field, VillageReach has found that working with academics provides them with a useful real-life case study and provides us with access to sophisticated, cutting-edge, cross-sector knowledge and best practices, so far it’s really been a win-win and we are excited to continue the work. A few weeks ago I traveled to Malawi to work on two projects that use SMS phone technology. One of these projects focuses on providing community health workers (CHW) with an easier and quicker way to communicate with their local hospital, supervisors, and fellow community health workers. I spent an afternoon with 18 of the 21 CHWs in the Kwitanda province to understand how they would utilize such technology, and used that information to develop use cases (e.g. outbreaks, inventory shortages, emergencies, etc.) that will help them provide better health care to villagers in their catchment areas. For the other project, I met with shop owners, assessed the medicines they sell, and discussed the benefits of inventory management with them (which is of personal interest to a supply chain person like myself). The insights I gained through interacting with CHWs and shop owners were then funneled to our technology team, which is working on our upcoming Management Information System (vrMIS3). I am excited about the potential that these two projects will have for those working in rural and remote areas with poor road and electricity infrastructure and for us, who will be able to collect real-time information about what the needs are in the field and how we can develop programs and innovative approaches to strengthen health systems at the last mile. Although my time in Malawi was quite busy, I was glad to have had the chance to visit an under-5 clinic, where large numbers of women brought their children to be weighed (for growth monitoring purposes) and to be immunized. In Malawi, like in most of the world, women spend their days collecting water and firewood, washing clothes, caring for handfuls of children, tending to their fields, and preparing meals. Yet these women were willing to put their other duties on hold so that their children could receive vaccines and have a chance at growing up healthy. The health workers in Kwitanda have done a great job at educating these women about the importance of vaccines and health care for their children. We’re happy to say it’s been a busy month of September here at VR. While we haven’t had much time to write- others are writing about us! Over at the Discovery Channel, they cheekily suggest we should get involved in the US healthcare debate (thanks, but no thanks), while the author at the Scientific American blog sees the link between our work and the new Swine Flu vaccine. Meanwhile, the NextBillion blog covers our panel at the SoCap Conference. Greetings from SoCap, the annual gathering of social entrepreneurs and investors here in San Francisco, billed as the largest of its kind in the world. Yesterday was a flurry of sessions covering topics as varied as India social business developers strengthening remote tribal communities through weaving and arts and craft cooperatives, to new pharmaceutical ventures for low income countries to benefit base of the pyramid communities. And VillageReach was there too. Craig Nakagawa, our CFO, and Keely Stevenson, from Bamboo Finance, lead a great session on the just-announced investment in our Mozambique propane business, VidaGas. Titled “Anatomy of a Social Investment,” the session covered the development of the business, its impact on the health system it was created to serve, and Keely and Craig looked at future opportunities for social businesses in Sub Saharan Africa. – the need for patient investors in social business ventures is key for both the initial development and long-term sustainability of these businesses. In our case, VillageReach’s hybrid non-profit/social business model has proven to be very valuable. Initial investment for VidaGas was supported by donor contributions, that otherwise would have been spent on the purchase of fuel and equipment that VidaGas sells to the market. We see this approach as a winning formula for donors who are interested in achieving long-term impact for their contributions. – Keely noted there are few base of the pyramid social ventures operating today. Some businesses have been created that serve middle-income communities that then attempt to reach out to lower-income consumers, but this can be a challenge where profitability is a requirement. Keely highlighted VidaGas’ market development approach as ideal, whereby we launched the company with the government health system as our initial anchor client, with some sales to lower-income communities also and then moved up-market to epand sales of the fuel to middle income consumers. The investment has only just been announced, but we’re looking ahead to the future. This week we’re meeting with a number of new investors to present a new proposal to broaden our base of household sales. We’ve put together a comprehensive market development proposal that is intended to add new retailers for propane and stimulate greater interest from communities who have previously had to rely exclusively on charcoal for their cooking requirements. 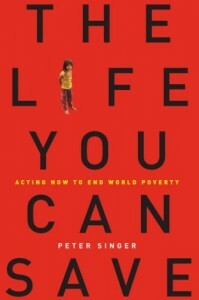 VillageReach Named 2009 Tech Awards Laureate! After yesterday’s announcement of Oasis Fund’s investment in VidaGas, VillageReach has even more good news to share: VillageReach has been recognized by the 2009 Tech Awards as a Laureate in the Health Awards category! Each year, the Tech Awards recognizes 15 global innovators who apply technology to the most critical issues affecting the world. This year, VillageReach was selected from among hundreds of nominations representing 66 countries. The Laureates are honored at a gala in San Jose in November. VillageReach’s Management Information System (vrMIS) was recognized because of the significant impact it made in improving information and decision making in VillageReach’s Mozambique program. Developing countries bear the greatest burden of infectious diseases, but they often have poor infrastructure to support critical public health programs. 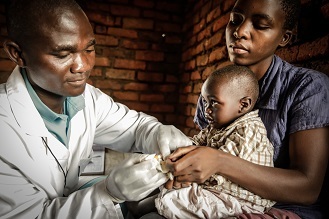 VillageReach worked with the government of Mozambique to implement vrMIS which enabled health workers in the field to send and receive data in real time and as a result, empowered health workers to make the best possible decisions based on accurate and timely information. The Rockefeller Foundation and Results for Development Institute just released their report that offers a landscape view of successful global healthcare financing and delivery models involving the private sector. VillageReach’s model is recognized as an innovative model in supply chain management. While the identified models span a wide variety of services and strategies, it is exciting to see a growing embrace of the role of the private sector in improving public health. When VillageReach began in 2001, it often felt like there was mutual distrust between the public health and development professionals and the private sector entrepreneurs. Reports like this are a nice reminder of how much and how quickly things have changed.